Manufacturing is one of the most essential parts of the United States’ economy, and CNC machinists across the United States are its backbone. 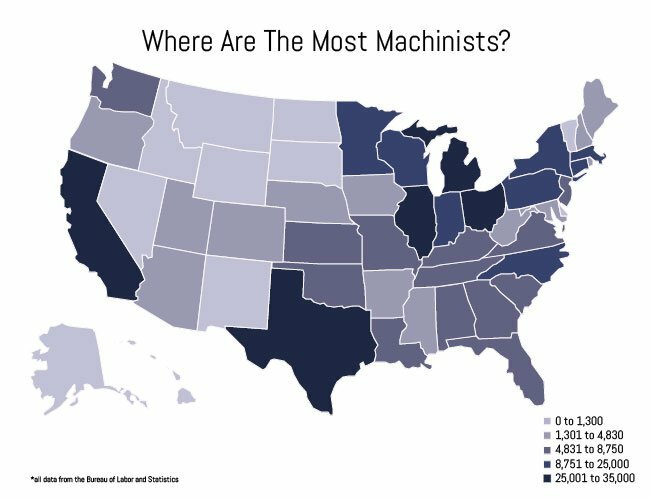 While it’s safe to say every state has machinists churning out parts and products every hour of every day, some states post more impressive numbers than others. You can see how your state measures up on the map below. Here at MakeTime, we offer online CNC machining as a service, but we know we’re only able to do that because of the excellent machinists at the helm of the nation’s CNC machines. While U.S. manufacturing is at a crossroads in many ways, it’s actually a great time to be a machine shop owner or employee, which means it’s also a great time to be us. We’re working ‘round the clock to put work on every machine that’s a part of our nationwide network. Together, we can keep proving the products “Made in the USA” are the finest in the world. Getting CNC components machined stateside has never been easier or more cost competitive. Learn more about how MakeTime’s online CNC machining platform can help you get yours.